Sophomore guard Justin Mazzulla faces off against Valparaiso players during a game earlier this month. Men’s basketball’s final nonconference win came down to the free throw line against American Saturday afternoon. A last minute layup by American (6-5) knotted the game 57–57 at the end of regulation, and the Eagles played the foul game in the extra frame, sending the Colonials (4-9) to the charity stripe with the hope of gaining extra possessions off unforced GW misses. Heading into overtime, the Colonials were 10-for-16 from the free throw line. But instead the Colonials converted in crunch time, going 9-for-11 from the free throw line to give GW crucial points. The team’s final five points of the game were all picked up from the charity stripe and helped GW pull out the 71–67 win. “It’s been a crutch for us all year, but I’m glad we finally turned a corner a little bit in terms of pressure situation free throws and knocking them down when they counted,” head coach Maurice Joseph said. With the win, the Colonials’ nonconference schedule came full circle – to open the season GW dropped to Stony Brook 77-74 in overtime, where the Colonials went 3-for-12 from the charity stripe. 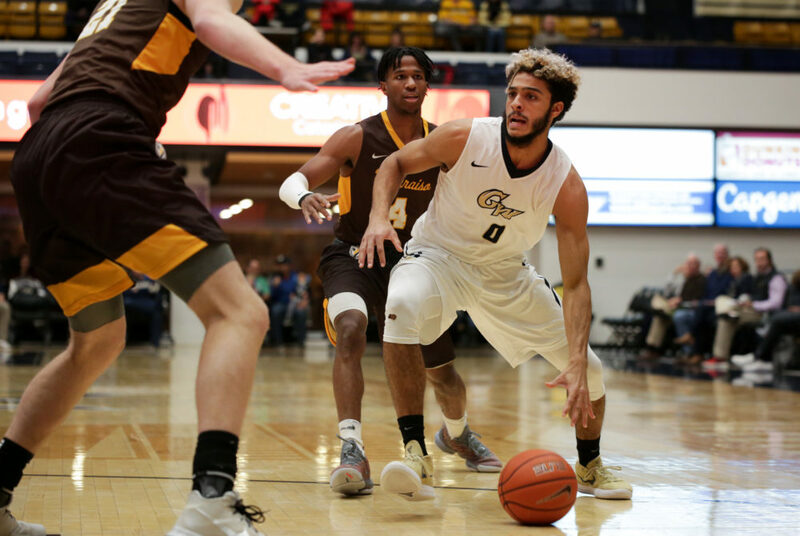 The Colonials were led by a trio of sophomores, starting with guard Justin Mazzulla, who racked up 19 points, five rebounds and three assists. The 19-point performance marks Mazzulla’s fourth consecutive game the guard with double-digit scoring for GW. On the block, sophomore forward Javier Langarica turned in a double-double performance with a career-high 15 points and 12 rebounds to his name along with five blocks. Guard Maceo Jack picked up 13 points, seven boards and a team-leading five assists in the match to round out GW’s top-three scorers. The Colonials ended the game shooting 33.8 percent from the field – well below American’s 40.0 shooting clip – but 70.4 percent from the free throw line on 19-for-27 shooting gave GW the advantage. Heading into the game GW was shooting 60.9 percent from the stripe. American junior guard Sa’eed Nelson entered the match averaging a team-leading 18.8 points per game, but GW’s defense limited him to seven points and three rebounds after going scoreless in the first 20 minutes of play. Sophomore forward Sam Iorio led the Eagles with 20 points and six rebounds. GW’s defense forced American to turn the ball over 20 times after the Eagles averaged 11.8 turnovers per game heading into the contest. The Colonials opened the night with back-to-back threes courtesy of Jack and sophomore guard Terry Nolan Jr. American hit a three of its own to tie the game after Jack’s opening shot, but the Colonials’ defense stonewalled the Eagles. American turned the ball over four times in the opening four minutes of the game and went 1-for-4 from the field to begin the half. GW broke open an 8-2 run that put the Colonials up 14–8 with 13:34 left before halftime before American’s offense started finding its footing. The Eagles hit a three-point shot and a layup off a turnover to cut the Colonials’ run short and bring the game within one point at 14–13. A tip-in shot from American freshman forward Josh Alexander gave the Eagles their first lead of the game 15-13 with about 10 minutes left to play. Langarica came alive in the back half of the frame, going on a lone 10-point run for the Colonials to keep GW competitive. A jumper from Langarica tied the game at 24-24 before American went on a 7-0 run to pull ahead by seven 31-24 with 2:51 left before half. Langarica and redshirt junior DJ Williams – who contributed 11 points to the cause – put up six unanswered points for the Colonials to cut into American’s lead 31-29 with 24 seconds left in the half, but Alexander knocked in another tip in shot to give the Eagles the 33-29 advantage heading into the break. The Colonials pushed the pace on offense to open the second half and regain their lead. A three-point shot from Jack to open the frame spurred a 9-2 run that ended with the Colonials up 38-35. The Eagles’ offense did not spark, with American going 1-for-6 from the field in the same span. But the game started to tip in American’s favor once again one minute after the midway mark in the half. Back-to-back turnovers from the Colonials resulted in a four-point swing from the Eagles that knotted the game 45-45 with 9:06 left in the game. Both teams went scoreless in the following two minutes before American junior forward Mark Gasperini broke the stalemate with a tip in to give the Eagles a slight 47-45 lead. The Colonials and the Eagles traded baskets before Nelson, who sat out the majority of the second half after picking up his fourth foul five minutes into frame, rejoined the game with three minutes left to play. Nelson scored American’s final five points of regulation to send the game into overtime 57-57. Nelson saw less than one minute of play in extra time before fouling out with 4:14 left in overtime. A 5-0 run from the Eagles put American up 64-61 but a foul on Nolan from beyond the arc resulted in three made free throws for GW to put the team back in the game with less than two minutes to play. Back-to-back turnovers from the Eagles paired with sharp shooting from GW at the free throw line gave the Colonials the final advantage on the day. The Colonials hit the road to kick off Atlantic 10 play Jan. 6 when they take on Saint Joseph’s. Tipoff is scheduled for 2 p.m.